For our children, the only Grandma they really knew and was close to was their "Ee-Poh", especially for Fei and Su who grew up with her in their early years when my father invited us to live with him for a season right after my serious car accident in the Chinese New Year of 1985. It was to help me in my recuperation and also assistance to Geok Lee, a young Mom who was expecting her second baby Su to be born in Oct the same year. Chak Wai Lin had become the 2nd wife of my father and 'Ee-Poh' to our children, thus she was added to the Family Tree of the Chong family. She being younger, born on 24 Oct 1944 was a help mate and companion to him till he passed away at 88 years of age on 20 Nov 2009. My mother had passed away much earlier on 22 Oct 1982. She would be the organizer of family gatherings especially for my father's yearly birthday celebrations that are usually attended by his children, grand children and great grand children! Getting all the immediate family members and their spouses together is never an easy task with many spread out geographically covering Malaysia, Singapore, Australia and the UK. Perhaps the biggest gathering was organizing my father's 80th birthday with some old pics seen here. Fei giving a surprise Chinese New Year visit from Beijing in 2009. Her good timing enabled her not only to see her 'Ee-Poh' but also her grandpa, not knowing that about 9 months later, he would suddenly pass away in November the same year. Fei had later gone to the USA to be married to Christopher Wyatt on 29 May 2010 the following year. Su got to visit her 'Ipor' in Penang, travelling all that distance after arriving in Singapore to find her hospitalized in Penang in July 2012. Her cancer diagnosed in 1990-91 had recurred. 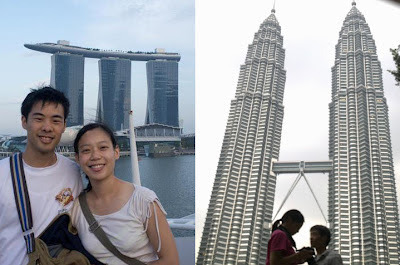 Just over a month later, after they had returned back to the US, I received a phone call in Singapore from my oldest Sister's family in Penang saying on the night of 17 August that she was in critical condition. Another phone call came in the next day informing me she had passed away at 6.30am. The funeral is on Monday 2pm at the Crematorium in Jalan Batu Gantung. Please check the google map here for location. Video clip of the funeral is found below. 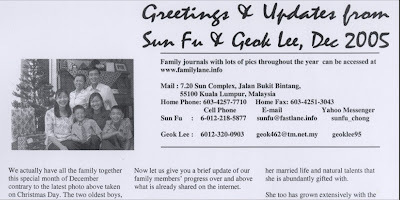 Having described Fei and Su growing up in their early years close to 'Ee-Poh', it does not mean the boys did not have much contact with her when we did not live in the same home any more. 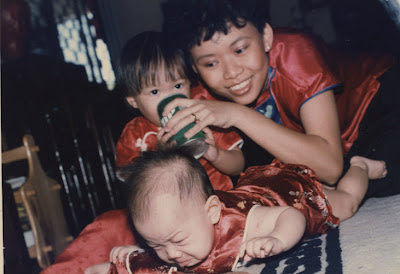 As we were still living in the same city of Kuala Lumpur, family gatherings on the subsequent birth of each child or for birthday celebrations, festive season celebrations and other family activities kept both the girls and boys closely in touch with their 'Ee-Poh'. Gathering time during the Chinese New Year where my sister was visiting from the UK too. Like most families with grand parents still alive, their homes serve as a gathering place for all the posterity. Though she was not the real grand ma of the family, the title of 'Ee-Poh' is a respected title given to a grand-aunt or step-grandmother. She did indeed fill the position as grand mother of the children because their real grand mother in KL had passed away long before they were ever born. ... including witnessing the baptism of our youngest Ray at Church. Mr Chia announces that the number of students receiving the awards has steadily increased from 422 in 2010 to 994 in 2012 as the above bar chart shows. .... so we're very proud of him that he made it again this year with a perfect GPA of 4.0 last semester! There was a nice tea reception after the awards program. With his older brother Han away on a mission, Shuan now leads the next generation to be winning awards in Singapore! In recognition of his many achievements accumulated to this date, like his older brother who was given a profile page at our familylane website, Shuan is also given his profile page on this day. Also his accomplishment this day will be added to the family post recording the boy's achievements since they first moved to Singapore in the year 2007.